Coffee Craze: What Keeps You Coming Back for More? Coffee consumers often fret at the thought of giving up their beloved beverage when embarking on a weight-loss journey. Which raises the question, what do we miss most about our daily cuppa? Believe it or not, not everyone relies on coffee for a pick-me-up or energy boost. In fact, many reasons why we enjoy coffee have nothing to do with what the popular beverage does for us but more the good feelings that surround this delicious delicacy. So, what if we said you could have your coffee break without the nasty caffeine jitters and still stay focussed on filling your body with balanced nutrition? Relaxing might not be the first thing that comes to mind when you think of coffee but often when we need a moment to ourselves to relax and take a break from the stresses caused from work, friends and even family, coffee seems always to be the drink of choice to accompany us in a time of need. A relaxing moment to ourselves doesn’t mean this drink isn’t also one of the most popular social beverages out there! The best of both worlds. Some would argue that coffee has overthrown alcohol as our social drink of choice and that’s because alcohol limits you to afternoon and at evening gatherings only (for the most part). That comforting smell of coffee is faultless in the morning, afternoon and at evening gatherings and is perfectly suited to discuss hard-hitting topics from business and politics through to the latest episode of Love Island. There are not too many greater feelings in life than the instant satisfaction from wrapping your icy cold hands around a warm mug of your favourite coffee delicacy. For some, their cuppa is a necessity to stop themselves freezing from the inside out! However, coffee connoisseurs and enthusiasts continue to reinvent the wheel with variations like iced coffee which have made it appropriate for all 12 months of the year. Simply put, people love the taste of coffee! No matter how you like yours, every coffee lover can agree that there’s nothing else like it. All this talk of coffee got you thinking about your next cup? 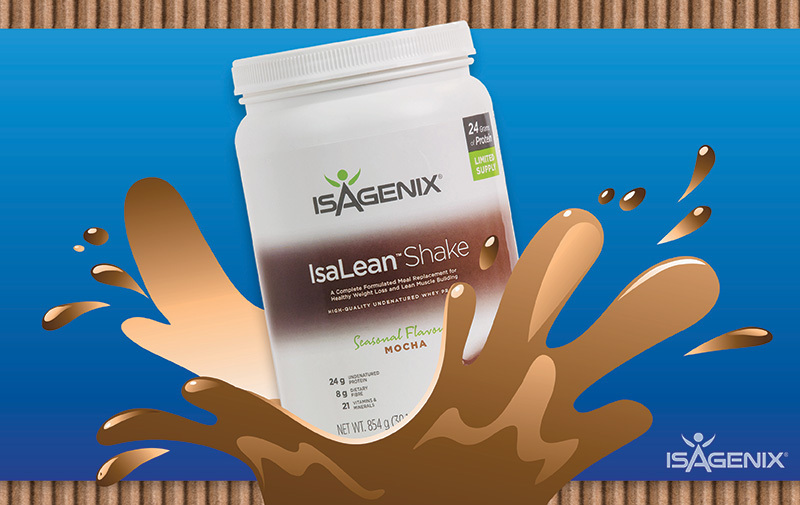 Look no further than Seasonal IsaLean™ Shake Mocha. Perfect for when you want to steal a moment for yourself or share it with friends. Whether warmed up or icy cold, Isagenix has found a way to combine your love of all things coffee and desire for a balanced lifestyle. Sound tempting? With 24 g of undenatured whey and milk protein, 8 g of dietary fibre and 21 vitamins and minerals, why not treat yourself to the decadent and comforting taste of mocha for breakfast, lunch or dinner. Stock is limited and only available through a Wholesale order, so be sure to jump on the IsaLife™ app and get your mocha fix. Join the mocha fan club by tagging @IsagenixANZ and sharing your mocha shake photos on Instagram with the #OhMyMocha hashtag. For more information on how to place a Wholesale order, visit our step-by-step guide.